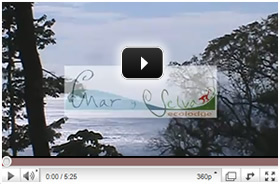 Mar y Selva Ecolodge is a member of the Adventure Hotels of Costa Rica. Find eco-friendly beach hotels, mountain lodges and unique, small hotels throughout Costa Rica. Overlooking the Ballena Marine National Park, "Mar y Selva" Eco-Resort Costa Rica- is near many other natural treasures such as Corcovado National Park, Caño Island Biological Reserve, the mangroves of the Sierpe and Terraba rivers, beaches like Uvita, Dominical in Costa Ballena welcome both photography and birding groups due to our location and facilities. providing a meeting and conference room. We are also equipped for training swim teams in our 25 meter lap pool, and affords tranquility required for small groups such as yoga retreats etc.Â Also provided for the convenience of our guests onsite rentals of mountain bikes and kayaks. Our Smoke Free Eco-Resort has ten bungalows with the following amenities (fan and A/C, Satellite TV, Mini fridge, hairdryer, Personal safe, abundant on demand hot water for tub or shower, wireless internet) with daily maid service. Each bungalow of the Eco-Resort has its' own balcony/deck with two chairs and coffee table andÂ is surrounded by primary and secondary jungle as well as fruit trees. Whilst hidden in the canopy of Costa Rica overlooking the South Pacific Ocean,Â we are privileged to witness the spectacular annual arrival of whales from July to October and then from September to April. The sounds of the ocean and jungle will accompany you throughout your stay at Mar Y Selva Eco ResortÂ providing memories of a lifetime.